On May 21st, Capital Records honored Garth Brooks for sales of over 60 million albums. You maybe asking, "what does this have to do with Mayberry?" Well, you may not know it but Garth is a BIG fan of TAGS. To celebrate the record setting sales by Garth, Capital wanted to throw him a 60s party. (60 million, 60s party...SAY, thats funny!) For a 60s party youve got to have things from the sixties so Capital went out and rounded up impersonators for John Wayne, Marilyn Monroe, Batman, and of course Barney Fife. If youre gonna get a Barney Fife impersonator, who else would you go after but the man who Don Knotts himself has open HIS shows as Barney...David Browning. They gave David a call after accepting is invitation he mentioned a friend of his down in Huntsville, AL that does "Floyd, the Barber." The folks in Nashville said they didnt really need a "Floyd" but, "being from Huntsville, do you think he could do an astronaut?" Well, you can bet that "Floyd" jumped at the chance to follow in the footsteps of Barney and wasnt at all reluctant to be an astronaut. After all, if Opie could make a movie about Forrest Gump being a spaceman surely "Floyd" could pull off being one. (Hes been told from time to time that hes a little bit spacey....) Besides that, "Mrs. Lawson" (a.k.a. Jan) would never forgive "Floyd" if he didnt take the job and give her a chance to meet Garth Brooks. Floyd went about gathering his official NASA spaceman uniform from the Space and Rocket Center in Huntsville. Of course the patches and pins he chose were those of Apollo XIII in honor of Opies movie. The big night came and it was a BIG party. Not much like Mrs. Wileys Tea party but enjoyable just the same. 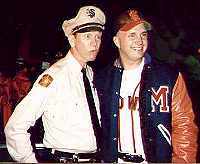 "Barney" was able to present a Mayberry Union High Varsity jacket to Garth that came from Greg Akers of The Mayberry Collection. "Floyd" was able to get information that TAGSRWC needed to make Garth an honorary member of the club. "Barney" introduced "Floyd" (dresses as he was) to Garths mom & dad and told them the "astronaut" was usually a barber. Garths dad spent the rest of the evening bringing his other family members over to have the "astronaut" talk like "Floyd" for them. It was truly a pleasure to have had the chance to meet all these fine, down to earth, people. Theyre all as nice as can be and are a welcome addition to Mayberry. Speaking with "Floyd" afterward, he said, "This is probably the most excited my mother has ever been about one of my appearances." I think that may be true of "Floyds" wife, too. carried in a chest pocket, all enemies become kind to you. carried in a lower pocket or purse, expect prosperity. placed in your pocket and an incant* is said, sore foot pain will vanish. Banish now from my sweet beau. Gordo, AL was home, once again, to the annual Mule Day celebration held the weekend of May 31 - June 1. 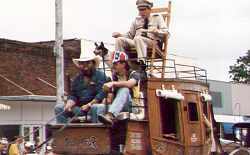 Barney Fife (David Browning) was on hand to help the local police keep law and order during the event. Barn even brought along Deputy number 3, Floyd Lawson (Allan Newsome), as an extra security measure. Friday night began with Barney and Floyd patrolling the streets in a 66 model Mayberry squad car (owned by Terry Duke) . Rumors were floating around town that one of the umpires over at the little league ball field was a big TAGS fan so Barney and Floyd went over to check it out. Turns out it was true. The umpire was so excited to see ole Barney that he missed a few calls and Barn had to write him up for bad calling. Floyd took advantage of the situation and spent his time looking for Henry Bennett, the jinx, and clearing home plate with his barber brush. Kids and grown-ups seemed to enjoy seeing the Mayberry citizens. Saturday was filled with events which drew to a close following the Mule Day Parade. Barney was asked to ride in the parade on top of an old west stagecoach. He was sitting up there in a rocking chair and if hed been wearing his wedding dress, you wouldve thought Granny Clampett was in town. It was a sight! Its always fun to travel down to Mule Day and next year promises to be even bigger with Kenneth Junkin saying they plan on having a show with TAGS cast members. Watch The Bullet for information but plan on attending. kickin' on a tin can.